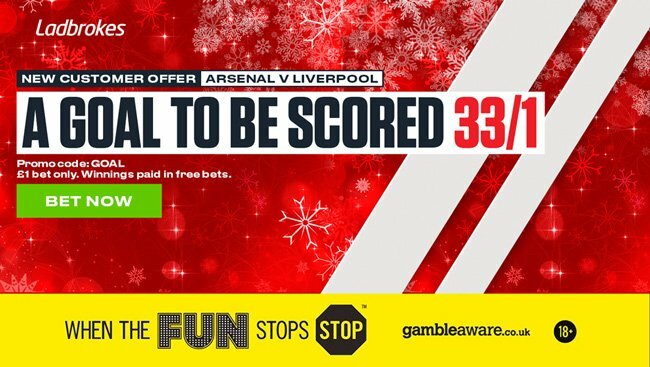 Ladbrokes offer 33/1 ANY GOAL in Arsenal v Liverpool! 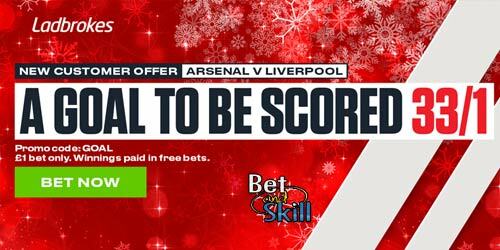 Two of the most entertaining Premier League teams, Arsenal and Liverpool, lock horns on Friday night and you can claim your early Christmas gift at Ladbrokes! Find here how to claim a 33/1 price boost for ANY goal to be scored in Arsenal vs Liverpool! Get a massive 33/1 on a goal to be scored in the Arsenal vs Liverpool game this Friday. This bet is normally available at 1/25! All you need to do is sign-up to a new Ladbrokes account. Join Ladbrokes via our special links and claim 25/1 for ANY goal to be scored in Arsenal v Liverpool! 3) Place a single bet of up to €/£1 on ANY goal to be scored in the Arsenal v Liverpool game before the kick-off. Offer available to new Ladbrokes Online & Mobile customers: Simply register today using promo code GOAL, deposit a minimum of £/€5, and place your first bet as a single bet of £/€1 on Arsenal v Liverpool (33/1). This offer is available from 08:00 Tuesday 19/12/17 until kick off (19:45) on Friday 22/12/17. "Ladbrokes offer 33/1 ANY GOAL in Arsenal v Liverpool!"